This cute Christmas gift expands to a high quality cotton guest hand towel, flannel or face cloth. 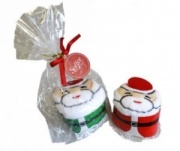 Individually packed in a clear plastic bag with decorative red stripes. Packed size approx. 7 x 5 cm, unpacked hand towel, flannel size 30 x 30cm.